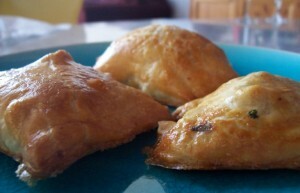 Easy Samosa recipe by Nabz at DesiRecipes.com. Dry cooked qeema (ground beef) with lemon or lime juice squeezed to give a kick. 1 Pack of Puff Pastry shells (frozen food aisle). Open the puff pastry shell box and pull out one pastry shell. Use a rolling pin to spread out the shell, should be wider than it is long (oval). Then take one small scoop of the cooked qeema and place on each side of the shell. Fold the cover over to close the shell. Once you have done that, chop with your hand in the middle of the shell to seperate the two sides. Use the crease as a guide and to cut with a knife to seperate. Do the same for the other 5 shells. You will have 12 samosae in all when you are done. Put them in a nonstick pan and you bake them on 325-350F until they are golden brown (about 15-20 min). Dont let the bottoms burn. Serve alone or with Chinese Garlic /Chili Paste. My mom makes these all the time and they are always a winner! Enjoy! how to prepared Qeema filling for samosa?